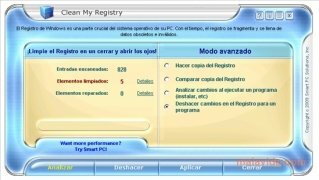 The Windows registry is one of the elements that affects the computers performance most, that is why it is essential to have a very good application to be able to clean it. 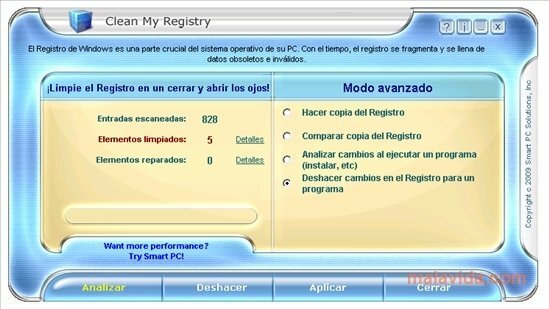 Clean My Registry is one of these programs. The vast amount of programs that we install on our computers nowadays, thanks to the great capacity of the new hard drives and the incredible variety of applications that we may need, manage to saturate our Windows registry with useless entries and values. Generally because of sloppy uninstalls. 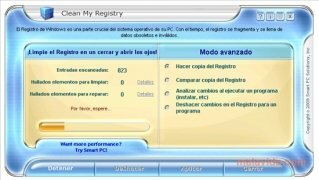 Clean My Registry analyzes your Windows registry to know what programs aren't installed, and their entries can be deleted, as well as, detecting the latest modifications that the registry has suffered, so it can undo them if necessary. 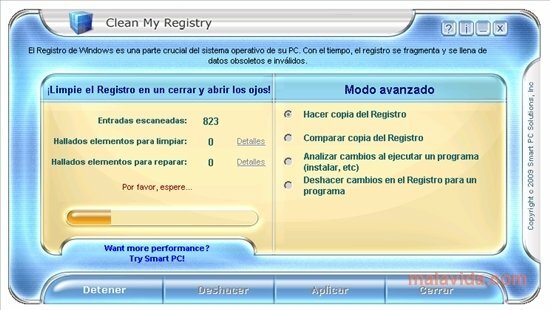 Clean My Registry's interface is as simple as possible, but this doesn't not mean it is not powerful. Any change can be repaired, improving security and assuring that nothing is going to go wrong in one of the most fragile points of Microsoft's operating systems.